AMD has confirmed that it will be directly providing driver updates for its Ryzen Mobile APUs via Radeon Software updates. This is a welcome move from AMD as it had previously put the onus of providing APU driver updates on laptop OEMs. Hopefully, this will bring APU users on par with desktop GPU owners in getting access to timely day-zero game support, feature updates. and bug fixes. AMD announced quite a handful of new Ryzen Mobile 'Picasso' APUs at CES 2019. On the heels of this reveal, the company also announced that it will be providing driver updates for these APUs directly via Radeon Software updates. This comes as a big relief to customers who have been playing the waiting game with OEMs who've never managed to release driver updates on a regular cadence. 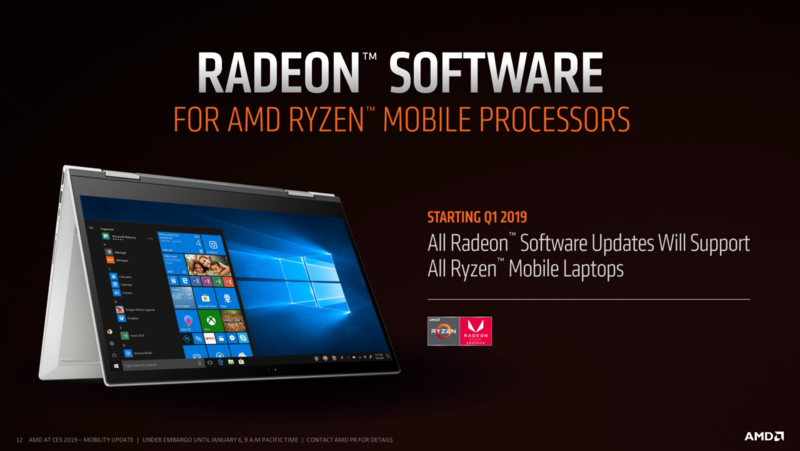 While desktop 'Raven Ridge' APU users at least had a quarterly release of new drivers, AMD put the onus solely on laptop OEMs in the case of mobile APUs. With users complaining about lack of driver updates for months on end, AMD claimed in a Reddit post that the delay in releasing new drivers was due to individual OEM optimizations and generic drivers could "result in less-than-ideal" user experiences". AMD, however, said that they are planning to work better with OEMs in delivering at least bi-annual updates starting 2019. The user response to AMD's assurance was understandably negative as Intel and NVIDIA drivers can be directly updated from their respective websites without having to rely on OEMs. Looks like AMD has realized that things should be streamlined and has now announced that, starting Q1 2019, APU owners will be getting driver releases in the same cadence as regular AMD GPU owners directly via Radeon Software. This means, less reliance on OEMs for drivers, better day-zero game support, feature additions, and bug fixes for APU owners. Truth be told, this should have been a non-issue and AMD should have enabled this process from day one. However, we are happy that AMD has taken feedback seriously and has finally saved current and upcoming Ryzen APU-based laptop owners from buyer's remorse. What do you think of AMD's move? Let us know in the comments below.